A regional newspaper has published a special preview of Jimmy Cricket’s forthcoming appearance in a variety show at the weekend. The famous entertainer is performing in the Studio Theatre at the Leicester Haymarket Theatre on Sunday (27 January) at both 5pm and 8pm. Impressionist and comedian Bobby Davro is hosting the Sunday Variety Show double bill. 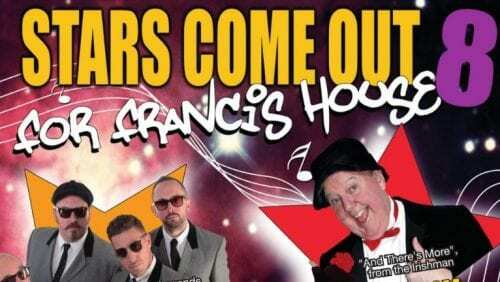 Other performers include Andy Eastwood, Steve Hewlett, The Satin Dollz, Steve Rawlings, Faryl Smith, Zooka and Suzie Q. The article (below) about Jimmy – headlined ‘We don’t like Cricket, we love him’ – was written by Lizz Brain, the Leicester Mercury’s theatre critic. The variety performance is being staged by Paul Burton Productions to raise funds for LOROS Hospice. The hospice looks after more than 2,500 people across Leicester, Leicestershire and Rutland very year, providing free, high-quality, compassionate care and support to terminally ill adult patients, their family and carers. Book tickets for one of the shows here. 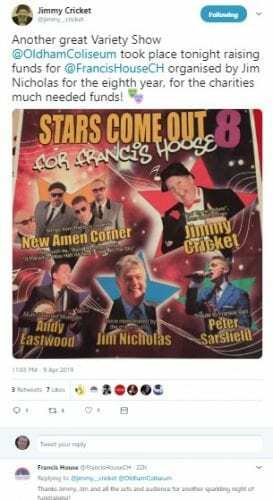 Jimmy Cricket is set to team up again with friend and multi-talented entertainer Andy Eastwood, who can do a “great George Formby tribute act”. 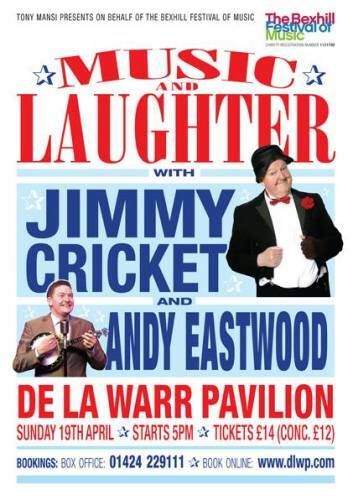 The famous comedian will appear alongside Andy at the De La Warr Pavilion in Bexhill-on-Sea, East Sussex, on Sunday 19 April. The show is being presented by the local Bexhill Festival of Music Society, which is led by Tony Mansi. Jimmy has worked with Andy on numerous occasions in the past and continues to be in awe of his musical talents. “Not only can Andy do a great George Formby tribute, but he is no mean musician with the ability to play several instruments at an incredibly high standard, including the violin and ukulele – plus many more,” said Jimmy. “Tony has put together a great early evening’s entertainment programme, with the show due to start off at the very family friendly time of 5pm. Wigan-born George Formby was an actor, singer-songwriter and comedian, who became known to a worldwide audience through his films of the 1930s and 1940s. On stage, screen and record he sang light, comical songs, usually playing the ukulele or banjolele, and became the UK’s highest-paid entertainer.